Tilapia coated with light mayo and seasonings - a great way to enjoy fish. Rinse fish with cold water and sprinkle with a dash of seasoned salt. Combine mayonnaise, lemon pepper, small squirt of spicy mustard, and sprinkle of dill weed. Coat fish with dressing mixture. 1082 members have added this recipe to their cookbook. I use Trader Joe's Aoli on my baked fish. Delicious and easy. One point per teaspoon. My family thought that this was great. Kept the recipe as written here except used a sprinkle of garlic and shredded parmesan as well. This was GREAT, and I have never much liked tilapia before! Perfect for any Atkins phase. We tried this recipe tonight, and it is now my FAVORITE recipe for tilapia! Absolutely DELICIOUS! My kids even liked it! i made this tonight for dinner ...and i thought it was really good...especially the only kid of fish i eat is fried:)i am trying more healthier things!! I'd make this again but would cut out the mayo (I scraped it off). Otherwise it was very tasty and my whole liked it. 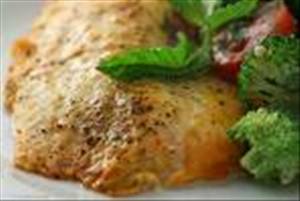 This was the best Tilapia recipe I have made and I have tried s many! Will be making this once a week fr sure!! It's decent considering I don't particularly like Tilapia. I would cut back on the lemon pepper seasoning, it was too strong for me. I would make this again. There are 165 calories in 1 serving of Baked Tilapia. Calorie break-down: 39% fat, 6% carbs, 55% protein.